Are you a newly engaged bride or a bride who is in the middle of planning and needs inspiration and education to plan your unique and special event? 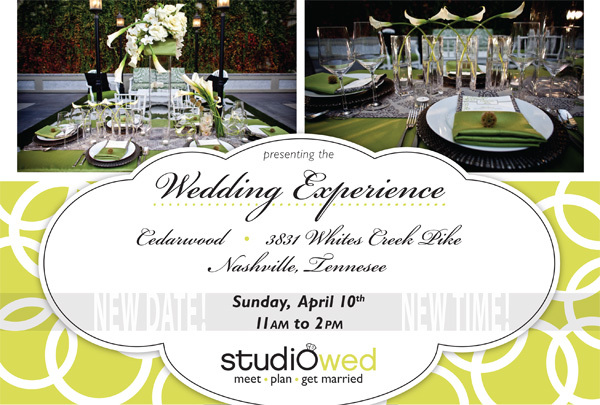 StudioWed is so proud to announce our first “Signature Event” of the year, The Wedding Experience! The Wedding Experience is perfect for newly engaged couples to jump start their journey down the aisle, featuring seminars geared toward helping couples plan a successful wedding. The day will consist of seminar sessions, table inspiration designs, and lunch. When: Sunday, April 10th from 11:00-2:00p.m. Type of Event: This is an event that you would come and stay the entire time to mix and mingle with our vendors, see displays, and get wedding planning advice. Cost: $15 per person or $25 per couple. Also, use the code “studiowedbride” to buy one, get one free for couples tickets! Limited time only… get your tickets today! Blogging Badges, show your support! Rachel & Gregory Anniversary Shoot Goodness. © 2015 - WedCandy - All Rights Reserved.